Place the ancho and chipotle chiles in a saucepan, cover with water and set over medium-high heat until it comes to a boil. Simmer at medium heat for 10 minutes, until the chiles are completely rehydrated. Place the rehydrated chiles into the jar of a blender, along with 1/2 cup of their simmering liquid, the garlic, cumin seeds, salt and olive oil. Puree until completely smooth. Scrape into a bowl and let it cool. Place the chicken in a container and cover completely with the garlic and cumin marinade. You can marinate it covered in the refrigerator up to two days. But you may also roast it right away without marinating ahead of time. If you marinated the chicken ahead of time, remove it from the refrigerator. Preheat oven to 450 degrees Fahrenheit. Generously grease a baking pan with oil. Place the chicken on the pan skin side down and sprinkle with a little salt. Put it in the oven and roast for 15 minutes. Carefully remove it from the oven, reduce the temperature to 375 degrees, flip over the chicken pieces and spoon any of the marinade on the bottom of the pan over the chicken pieces. Pour the chicken broth onto the bottom of the pan and return to the oven. Roast for 45 to 50 more minutes, or until the chicken is cooked through and the juices run clear – and there are barely any juices when pierced with a knife. Delicious! This is the first of your recipes that I have followed. My Mexican mamá fell in love with the dish. I am sure to try more recipes en el futuro. Are the moritas in addition to, or in place of, the dried chipoles? I’m thinking it doesn’t matter, but want to get a second opinion before I begin the pollo ajocomino. A long, long time ago, I attended a wedding in Tijuana where I tasted homemade mole for the first time. I asked how it was made and the maker just smiled and told me there were too many ingredients and it was too difficult to explain. She was undoubtedly right. Thanks for helping keeping your recipes simple for me. Thanks, too, for helping me cook through the winter. Oh thank you Jim! You can use either type of dried chipotle peppers. Enjoy! Oh that sounds so tempting, Travis. And enjoy the episodes on Amazon! 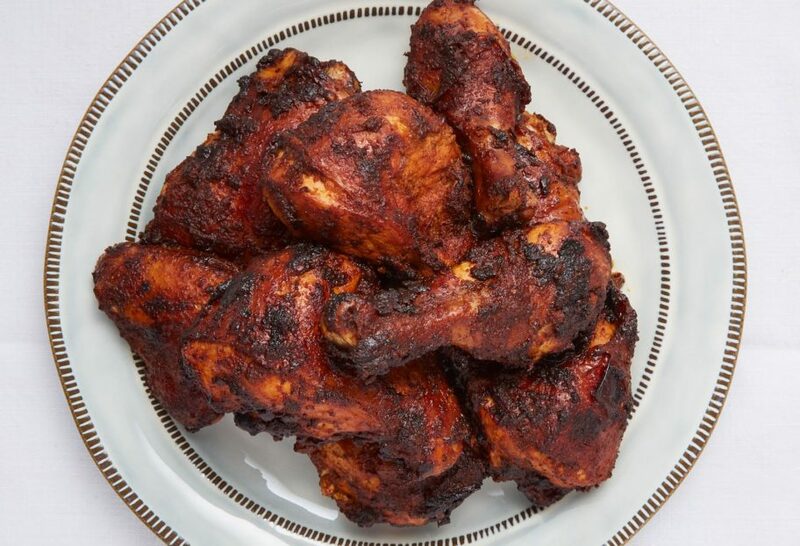 Made this using 10 thighs instead of the whole chicken….it worked out well. I don’t care for garlic but hubby does, made this as a treat for him, but to my surprise, the garlic was NOT overpowering like I thought it would be. It ended up with LOTS of juice, didn’t need to add any after the first round. Will make this again for sure. So glad you and the hubby enjoyed the chicken. I love your show and watch it everyday. I am going to prepare this dish with the salad from the same episode for my family. Would you mind telling me where I can find the ancho chili, chipotle chili, and Chile’s de arbol? I live near Boston and I have tried our local grocery stores and they don’t carry them. Hope to hear from you. Thank you. If your local grocery store doesn’t have them…you can try your local Latin or International market, Layla. Or you can also find them on line. Enjoy the chicken! Do you have a video of the “how to cut up chicken” like your mom showed you. Looked easy but….